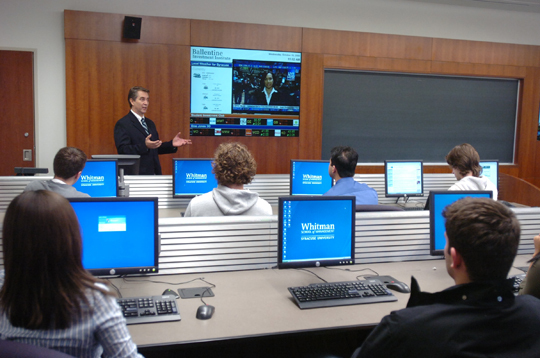 Whitman Professor of Finance and Director of the Ballentine Investment Institute Fernando Diz teaches a class in a high-tech classroom. Syracuse University’s Task Force on Advancing New Pedagogies, formed six months ago to study innovative teaching methods and new technologies employed in instruction across campus, has issued its final report, highlighting exemplary work being done at SU and urging increased awareness and adoption of best practices in use at SU and elsewhere. Co-chaired by Dean Elizabeth Liddy of the School of Information Studies (iSchool) and Lois Agnew, associate professor of writing and rhetoric and chair of the Writing Program in The College of Arts and Sciences, the task force of faculty and staff from each of the University’s schools and colleges and key academic support units underlined that new and emerging instructional approaches and tools are proliferating as learning patterns and preferences among college-going students shift rapidly and faculty members adapt to optimize student learning. The task force identified more than 280 examples of SU courses already integrating innovative teaching approaches and recommended strategies to highlight, support and expand structures and initiatives aimed at enhancing the excellence of teaching and learning at Syracuse. “Instructional excellence long has been a pivotal aspect of Syracuse University’s identity and value proposition, the importance of which is increasing today,” says Vice Chancellor and Provost Eric F. Spina, who commissioned the task force. “Across SU and across the nation there is a growing sense that we are at an inflection point in higher education, when change accelerates and a new trajectory is set. Recent technological advancements are a major reason behind this, but so are the desires of our faculty to enhance their effectiveness and our students to be more active participants in their learning inside and outside the traditional classroom. L.C. 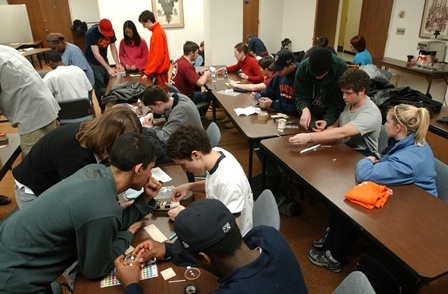 Smith College of Engineering and Computer Science students using class time to work on a group problem-solving activity. Liddy believes a key takeaway from the report is that best practices already are being employed by faculty members at SU; the challenge is to find ways to broaden and deepen their use. The task force specifically recommended exploring ways to enable academic units to extend the impact of SU faculty members’ research and teaching by enrolling non-SU students in SU courses, while enriching the array of course offerings available to SU students by enabling them to enroll in courses from other universities whose strengths complement SU’s. This would entail exploring multi-university consortia through which the faculties of SU’s academic units could establish cross-university course articulations based on their assessments of need, fit, quality and equivalence. Spina lauds the work of the task force and looks forward to next steps. “Under the leadership of Liz and Lois, the task force has done a superb job of surveying the landscape at SU and nationally, providing the excellent knowledge base we need to move forward confidently and swiftly to enhance our culture of teaching excellence in these rapidly changing times,” Spina says. Spina will be scheduling meetings with the University’s deans and appropriate institutional governance bodies in the coming weeks to discuss the task force’s findings and recommendations as coordinated efforts move forward to engage the campus on multiple levels, from individual programs and departments to college- and University-wide efforts. Spina and the task force co-chairs are urging all SU instructors to read the report, and contribute to the campus-wide conversation on teaching through the task force website.